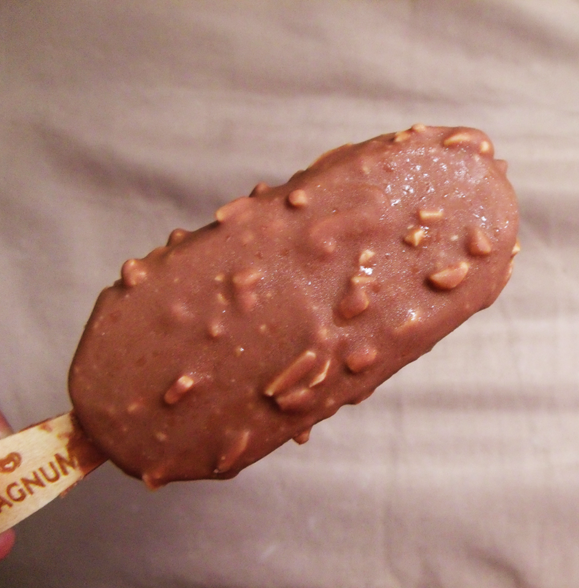 So that's what the Magnum hype's all about. Finally got to try the well-advertised in the world wide web Selecta Magnum bars, released just in time for the smoldering summer heat! First of all, I think it's too pricey for what it's worth. But it satisfies my craving for chocolate and ice cream, so what the hell. As from my previous post, I bought all variants available right now (no, I didn't eat them all in one sitting haha) just to try and have my folks at home try it. 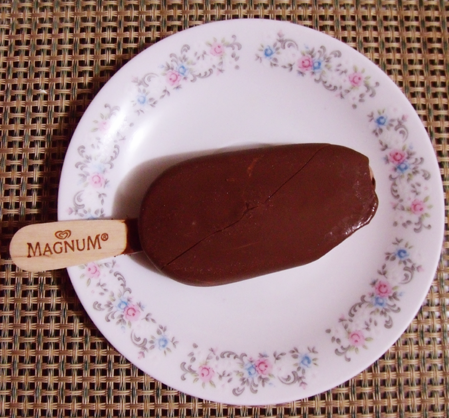 From what I read, Magnum is a big hit internationally with Eva Longoria and Rachel Bilson as its endorsers. Though it's being coined as an 'adult ice cream' or for the adult market, just watch the product's TVCs and you'll definitely understand why. And there is also a condom brand under the same name, IDK if that was intentional or what. Haha. Locally, the ice cream's endorsers are Solenn Heusaff, Liz Uy, Tessa Prieto-Valdez and uh, yes... Raymond Gutierrez. I tried the Chocolate Truffle flavored first since I love truffles. Heh. Look at that floral porcelain plate. 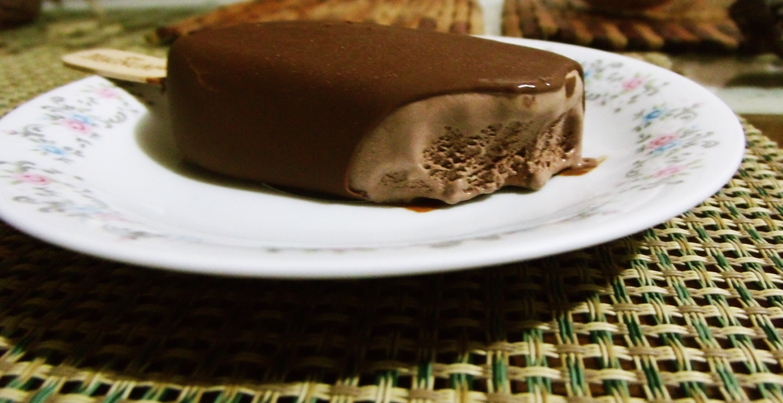 Belgian chocolate coating on chocolate ice cream. What I loved most was the chocolate coating. It was just so yummy! And there's something about that coating--when it cracks everything just seems to be even more mouth-watering. Haha. But I thought the chocolate on chocolate was just a little over the top. I really love chocolates but I was not completely sold on this one. On a separate occasion (haha), I bought the Almond variety. Yes, a better picture than the first. I loved this more than the Chocolate Truffle flavor, surprisingly. You can really enjoy the Belgian chocolate because the ice cream is vanilla. Though, there is nothing spectacular about the vanilla ice cream--just your plain vanilla ice cream. 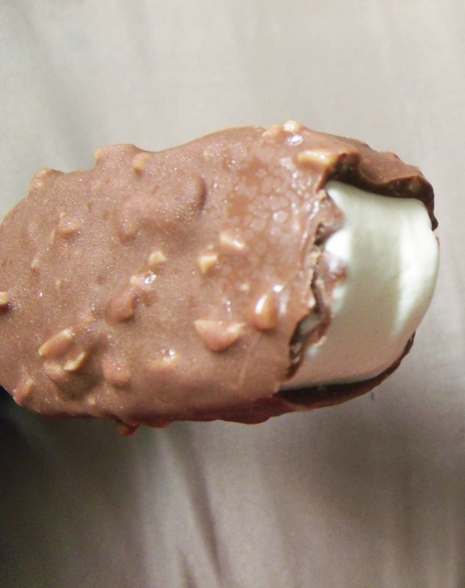 But the good thing about is that it makes the chocolate's deliciousness pop out even more! And you will enjoy the crunch of the almonds everytime you take a bite! Two thumbs up for this one! As I said, it's a little bit expensive for an ice cream bar. You can buy Dairy Queen's Dilly bar for around half the price or Selecta's Cornetto White Chocolate for 20PhP. But if you have the luxury or just want to try it out to see what's the hype about, I think you will be fairly pleased! This is an ice cream bar full of sunshine! 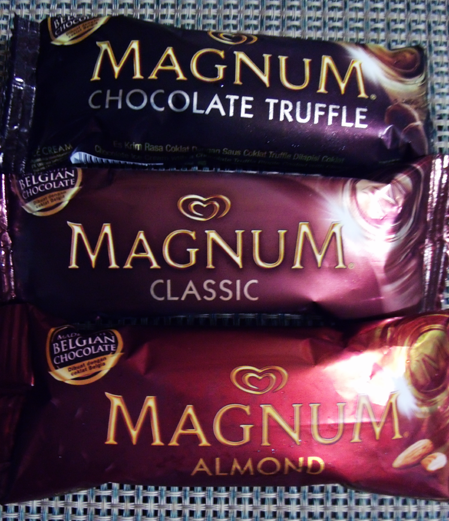 I hope they'll sell the Magnum White and Double Caramel in the future too.